Like the pet rock, an invisible dog on a leash, or cans of sunshine you can buy at tropical tourist traps, with Mattel’s latest San Diego Comic-Con exclusive you’re mostly paying for an amusing gimmick. 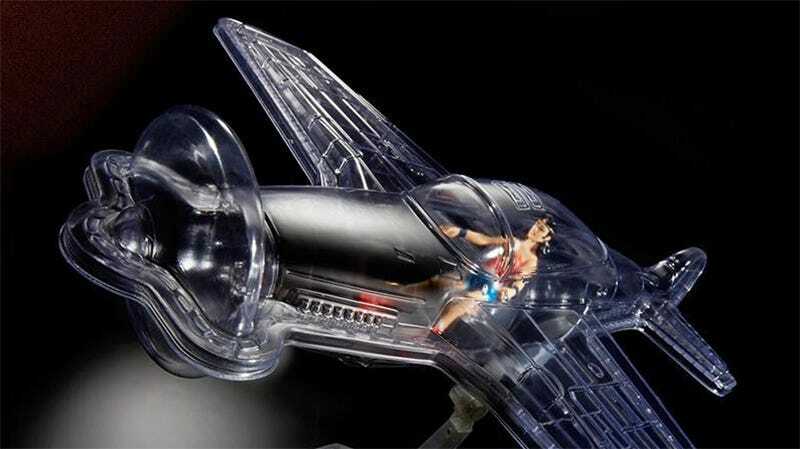 But that’s not going to stop rabid Wonder Woman fans from grabbing her invisible jet once it hits MattyCollector.com. There are no pricing details just yet, but the collectible, which appears to be made from the same impossible-to-open plastic blister packaging material that holds figures to their cardbacks, also includes a 3.75-inch version of Princess Diana of Themyscira—better known as Wonder Woman. The plane includes a display stand, from the looks of it, but that’s about it. Everything else about the collectible is completely invisible. So hopefully Mattel keeps the pricing reasonable for this one.